Monica, is a successful, well regarded surgeon and physician who is ashamed of something in her past. She can't develop any meaningful relationships with anyone and pushes anyone who gets close, quickly away. Maj-Britt, hiding from the world behind an endless supply of food requires help just to live, she is so obese. Locked in her apartment away from the world, Maj-Britt is deeply ashamed of something in her past. Monica and Maj-Britt don't know each other, yet somehow, because of a conference, a car-accident and a care-worker, they briefly collide. The results of that collision, catastrophic for one in the short term, force both of them to confront the past and deal with their personal shame. SHAME is not a novel for readers who like a murder right up there are the front of the book, with an investigation to resolve the crime. There really is no murder in SHAME, but there is death, sadness, despair, personal angst and profound tragedy and sorrow. SHAME takes you carefully through the lives of Monica and Maj-Britt, revealing the events that lead to the shame that they each feel, and what has happened to each of them since. As those events are revealed, a connection between the two women slowly eventuates. The connection could save them, or it could destroy them both. 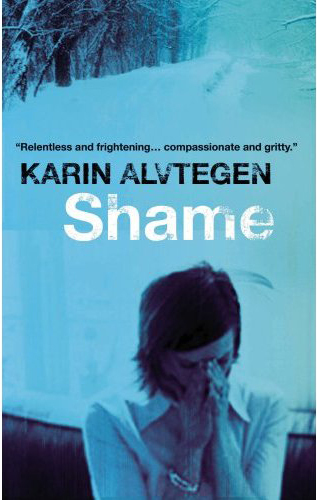 With elements of fear, oppressive religion, obsession, betrayal, sexuality, guilt, family dysfunction and emotional blackmail, SHAME is challenging and sometimes harrowing. It is also compelling, taut, intriguing and, ultimately, uplifting.